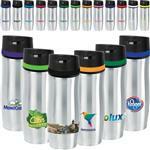 The Himalaya Travel Mug Stainless Steel Outer And Inner. Double Wall Construction For Insulation Of Hot Or Cold Liquids. Spill-Resistant Slide Action Lid With Rubber Gasket. Due To Vacuum Insulation Technology, Capacity Is 18 Oz. With Lid On. 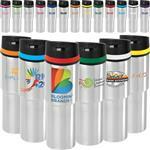 Meets FDA Requirements and is BPA Free. Hand Wash Recommended. Keeps Drinks Hot Or Cold Up To 6 Hours. 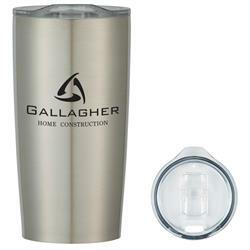 A popular travel mug style in retail! Production Times Available: Rush available! Standard 5-7 Day Production with a Paper Proof. Available Imprint Options: Screen Print. Inquire for laser. 29 pounds for a box of 36 pieces.